A panel of top scholars presents the first comprehensive collection of primary sources from Unitarian Universalist history. This, the first of the two-volume set, covers the early histories of Unitarianism and Universalism, from the third century up to 1899. From Arius and Origen to Theodore Parker and Olympia Brown, this rich anthology features leaders, thinkers, and ordinary participants in the ever-changing tradition of liberal religion. This volume contains more than a hundred distinct documents, with scholarly introductions by leading experts in Unitarian Universalist history. The selections include sermons, theologies, denominational statements, hymns, autobiographies, and manifestos, with special attention to class, cultural, gender, and sexual diversity. Primary sources are the building blocks of history, and A Documentary History of Unitarian Universalism presents the sources we need for understanding this denomination’s past and for shaping its future. 1568 Francis David, "The Edict of Torda"
1569 Francis David, "Propositions of the Nagyvarad Debate"
1648 The Cambridge Platform; Gerrard Winstanley, "The Mysterie of God, Concerning the whole Creation, Mankinde"
1748 Jonathan Mayhew, "Men, Endowed with Faculties Proper for Discerning the Difference betwixt Truth and Falsehood"
1759 James Relly, Union: or, a Treatise of the Consanguinity and Affinity between Christ and his Church; Ebenezer Gay, "Natural Religion, as Distinguish'd from Revealed"
1790 Judith Sargent Murray, “On the Equality of the Sexes"; Philadelphia Convention of Universalists, “Articles of Faith and Plan of Church Government"
1805 Hosea Ballou, A Treatise on Atonement; Jedidiah Morse, “The True Reasons on which the Election of a Hollis Professor . . . Was Opposed"
1809 Lucy Barns, “To a friend, who could not believe in the final holiness and happiness of all mankind"
1815 William Ellery Channing, “A Letter to the Reverend Samuel C. Thatcher"
1816 John Murray, Records of the Life of the Rev. John Murray; Judith Sargent Murray, Conclusion of Records of the Life of the Rev. John Murray; William Ellery Channing, Sermon on “War"
1817-1818 Hosea Ballou and Edward Turner, “On Future Misery"
1819 William Ellery Channing, “Unitarian Christianity"
1821 David Reed, “To the Public"
1827 Caleb Rich, “Narrative of Elder Caleb Rich"
1830 “Trust Deed of Adi Brahmo Samaj"
1831 Henry Ware, Jr., On the Formation of the Christian Character; Adin Ballou, “Epistle General to Restorationists"
1832 Hosea Ballou, “Author’s Preface to the Fifth Edition of A Treatise on Atonement" ; Ralph Waldo Emerson, “The Lord’s Supper"
1838 Ralph Waldo Emerson, “Divinity School Address"; Henry Ware, Jr., “The Personality of the Deity"
1839 Andrews Norton, “The Latest Form of Infidelity"; James Martineau, “Christianity Without Priest, and Without Ritual"; Adin Ballou, “Standard of Practical Christianity"
1841 Ralph Waldo Emerson, “Self-Reliance"; Theodore Parker, “The Transient and Permanent in Christianity"
1845 James Freeman Clarke, “The Principles and Methods of the Church of the Disciples"; John Turner Sargent, An Answer to “Questions Addressed to Rev. T. Parker and His Friends"
1848 Henry David Thoreau, “Civil Disobedience"
1849 Antoinette Brown and Lucy Stone, Correspondence; Edmund Hamilton Sears, “It Came Upon the Midnight Clear"
1851 Theodore Parker, “Speech at the Ministerial Conference"; Thomas Starr King, “Substance and Show"
1853 Frederic Henry Hedge, “Beneath Thine Hammer, Lord, I Lie"
1854 Ezra Stiles Gannett, “Relation of the North to Slavery"
1856 John Cordner, “The Foundations of Nationality"
1858 Theodore Parker, “A False and True Revival of Religion"; Thomas Wentworth Higginson, “Saints and Their Bodies"
1859 Theodore Parker, Theodore Parker’s Experience as a Minister; Henry Whitney Bellows, “The Suspense of Faith"; Henry David Thoreau, “A Plea for Captain John Brown"
1860 Frederic Henry Hedge, “The Broad Church"
1860, 1863 Thomas Starr King, “Sermon on Yosemite,” “Lessons from the Sierra Nevada"
1866 Frances Ellen Watkins Harper, “We Are All Bound Up Together"
1867 Francis William Newman, “Why Do I Not Call Myself a Christian?" 1870 “What Is the Aim of the Woman Movement? ; Julia Ward Howe, “Mother’s Day Proclamation"; Francis Ellingwood Abbot, “Fifty Affirmations of Free Religion"; Thomas Wentworth Higginson, The Sympathy of Religions; Hannah Tobey Farmer, “Hymn"; Olympia Brown, “Hand of Fellowship"
1871 Phebe Hanaford, “The Question Answered"
1873 Louisa May Alcott, “Transcendental Wild Oats"; William James Potter, “What Is Christianity, and What Is It to Be a Christian?" 1876 Charles Wendte, “The Chinese Problem"
1878 Lydia Maria Child, “Aspirations of the World"
1883 Mary Livermore, What Shall We Do With Our Daughters? 1885 James Freeman Clarke, “The Five Points of the New Theology"
1886 Elizabeth Palmer Peabody, “Religious Nurture"; Jabez Sunderland, “The Issue in the West"
1889 Mary Safford, “Obedience to the Heavenly Vision"
1891 Constitution and By-Laws of the First Icelandic Unitarian Church of Winnipeg; Magnus Skaptason, “Sermon delivered at Gimli"
1894 Caroline Bartlett Crane, “What Women Can Do in Uniting the Culture and Religious Forces of Society"
1895 Phebe Hanaford, “Comments on Deuteronomy"
1899 “Creed and Conditions of Fellowship"
Unjust laws exist: shall we be content to obey them, or shall we endeavor to amend them, and obey them until we have succeeded, or shall we transgress them at once? Men generally, under such a government as this, think that they ought to wait until they have persuaded the majority to alter them. They think that, if they should resist, the remedy would be worse than the evil. But it is the fault of the government itself that the remedy is worse than the evil. It makes it worse. Why is it not more apt to anticipate and provide for reform? Why does it not cherish its wise minority? Why does it cry and resist before it is hurt? Why does it not encourage its citizens to be on the alert to point out its faults, and do better than it would have them? Under a government which imprisons any unjustly, the true place for a just man is a prison. The proper place to-day, the only place which Massachusetts has provided for her freer and less desponding spirits, is in her prisons. . . . It is there that the fugitive slave, and the Mexican prisoner on parole, and the Indian come to plead the wrongs of his race, should find them; on that separate, but more free and honorable ground, where the State places those who are not with her, but against her,—the only house in a slave-state in which a free man can abide with honor. If any think that their influence would be lost there, and their voices no longer afflict the ear of the State, that they would not be as an enemy within its walls, they do not know by how much truth is stronger than error, nor how much more eloquently and effectively he can combat injustice who has experienced a little in his own person. Cast your whole vote, not a strip of paper merely, but your whole influence. A minority is powerless while it conforms to the majority; it is not even a minority then; but it is irresistible when it clogs by its whole weight….. I was not born to be forced. I will breathe after my own fashion. Let us see who is the strongest. What force has a multitude? They only can force me who obey a higher law than I. Source: Henry David Thoreau, “Resistance to Civil Government,” in Reform Papers, ed. Wendell Glick (Princeton: Princeton University Press, 1973), 65, 67, 72-73, 76-77, 79-81. Unitarian Universalists today can benefit from greater awareness of the depth and resources of their own faith tradition. This excellent and well-edited collection will go a long way toward meeting that need. The material is well-chosen, and the helpful introductory comments place the selections in context. Overall, an excellent and much-needed resource. 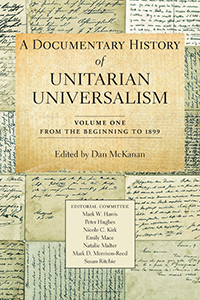 Dan McKanan and his editorial committee of scholars have provided the Unitarian Universalist community with a marvelously useful access to its rich heritage in A Documentary History of Unitarian Universalism. With curated writings from early Christianity to the twenty-first century, this collection offers the defining texts of this diverse liberal religious tradition. The compilation is of particular value for its inclusion of texts that illuminate both the religious doctrines and the institutional events that have shaped the complex history of Unitarian Universalism. The authoritative introductory essays provide an illuminating synthesis of the numerous Universalisms and Unitarianisms that have contributed to the movement.